Many shipping companies has now involved in R&D for the future fuel saving technique. The innovation in design, propellers and rudders, machineries associated with the fuel saving etc., Now the talks are revolving around the shipping circle about future fuel as the LNG fuel cell and hydrogen fuel cell. 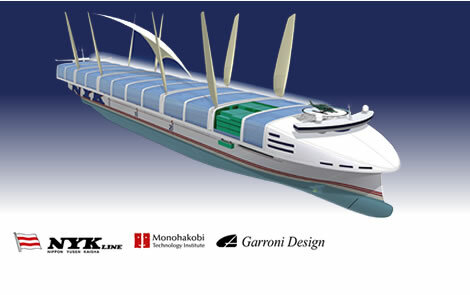 Now the NYK have designed the future model ship 2030 in association with Monohakobi technology institute, Elomatic – a marine consulting company from Finland, Garroni Progetti S.r.i a ship designing company from Italy. NYK super Eco ship 2030 has installed a sail, solar panels in the weather deck contributing 2 to 5 MW of renewable energy out of 40 MW propulsion energy. It uses LNG fuel cell as the main source of fuel which reduces 70 % less Co2 emission which makes our planet further a better place to live in the future. The ship is 350 meters in length, 55 meter breadth, draft approx. 12 meter with container carrying capacity of 8000 TEU. 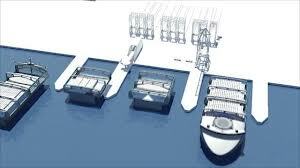 Vessel is equipped with 2 tunnel thrusters with two podded drives, contra rotating propellers in forward. The air bubbles are ejected under the hull to the frictional effect, thereby reducing power requirement by 10 %. Also it has a unique design to overcome the wind and wave resistance and therefore further reducing the power requirement. The vessel is equipped with multiple self unloaders and most shocking part is – the vessel is able to detach into parts and raised the question of watertight integrity in extreme weathers. Due to its unique design with self-Unloaders, solar panels and sails, the deadweight of the vessel has been wasted. For the same size of the vessel, the present vessel has the carrying capacity of 16000 TEU. This will increase the fleet strength in the world in future.The increase in fleet strength will increase the freight cost due to the extra cost incurred by operation and other costs.As we saw it in the past, the time is directly proportional to the size and deadweight of the vessel. Further sea transport increases 3% annually; there is a chance of a worldwide fleet increase dramatically. But the change in this kind of vessel is heavily depends upon the stringent regulation of IMO and other organization. Unless there is a stringent regulation and forced act to change the ships and port across the world, there will not be any transformation. Further it heavily depends upon transforming ability of the shipping industry from one form to another form. It also depends upon the transforming ability of the port to accommodate the big vessels, Bunkering LNG fuel to the vessel around the world. How IMO did through MARPOL ? And how the Chennai traffic department failed to do ?